I have forever been a fan of the Chinese cuisine. 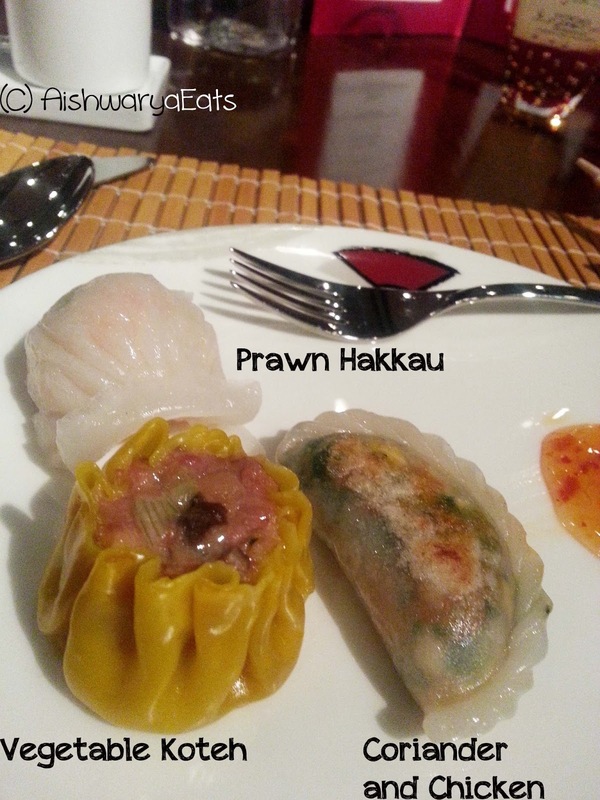 That included anything remotely related to prawns, noodles, chicken and cashews. Well, I grew up, and I realized that China actually included Thai, Vietnamese, Burmese, Korean, Malaysian and Japanese foods! Not that I minded. I still love ALL of it! So when the Bloggers' Table was invited to the absolutely stunning Pan Asian in WelcomHotel Sheraton Saket, that opportunity is not to be let off. You know why? I'll tell you why. 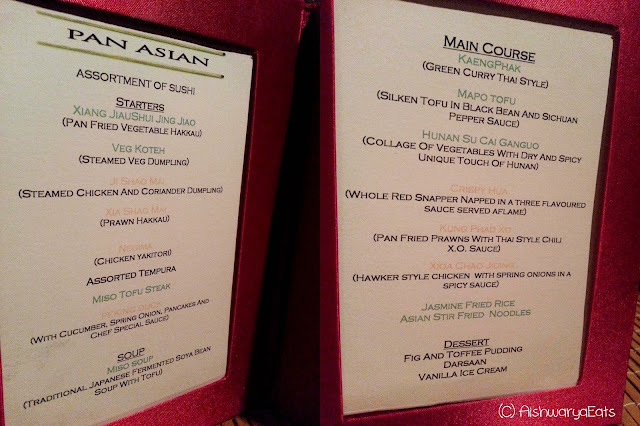 Because Pan Asian is the most amazing Oriental and Asian food. In. The. World. And the service? You'd feel like the king of the world! If I were to sum up our entire experience in, uhh..4 words they would be, elegant and tastebud-exploding-delicious. There was food, food and more food making its way to our table in the private dining room, to the point that we over-ate. But it was worth it. I mean take a look at the menu will you? We started off with Boiled Edamame, Soy Peanuts and Pickled Vegetables. 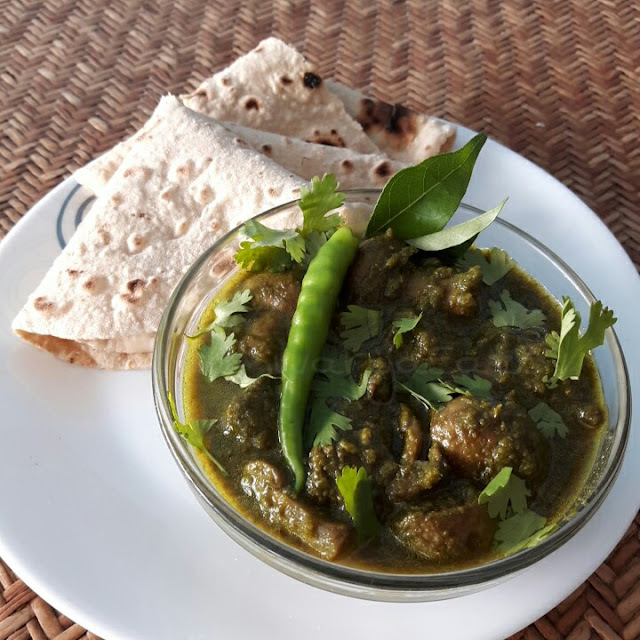 Ruchira taught me how to savour that green buttery taste of edamame. Tell me, doesn't it taste so cleansing to your digestion when you're eating it?? 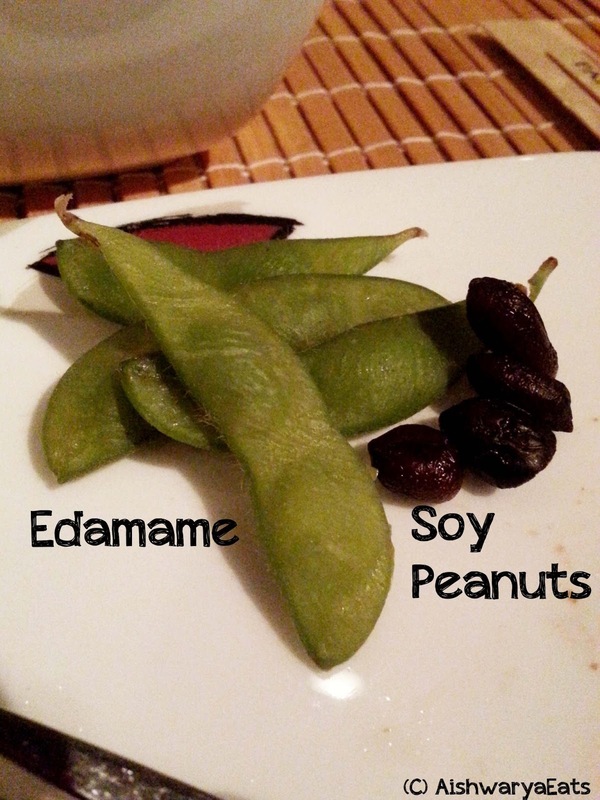 The soy peanuts were soft, yet full-bodied and had that strong black flavour of soy. All of us, we couldn't keep our hands off the peanuts. The pickled vegetables, were mouth-puckeringly sour, crunchy, colourful and polished off as soon as it came! We next had a sushi sampler. The non-vegetarian platter included Yellowfin Tuna and Salmon Nigiri and Makizushi. 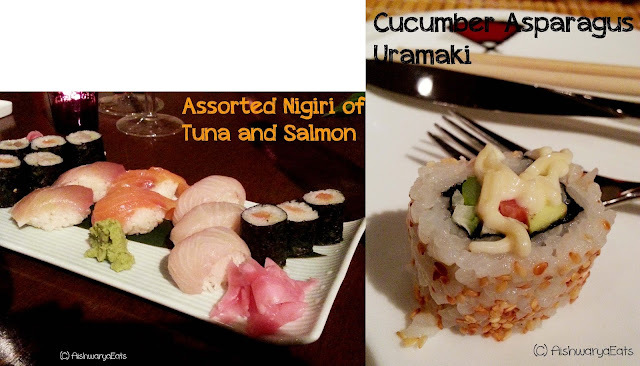 The vegetarian options were cucumber, asparagus and pickled radish makizushi and uramaki accompanied with the pungent wasabi and the vivid pink ginger. Nigiri is the oval rice ball with a piece of fish draped on it, and Makizushi is the topping encased in sushi rice and wrapped with nori. Uramaki is makizushi inside out, with mayo and an outer crunchy coating of sesame. The pearly white Tuna and the pink Salmon did not agree with me, though Sangeeta said it was very good. The vegetarian makizushi was fabulous, fresh crunchy and so well made. The Uramaki, though, was the highlight of the platter. I could have eaten like 8 plates of it. But then I wouldn't be able to dive into whatever came after that. By then, we were introduced to the absolutely adorable Chef Nariyoshi Nakamura. You know there used to be those Japanese programs on DD in the early 90's. He looked like a crumply grandfather from those! 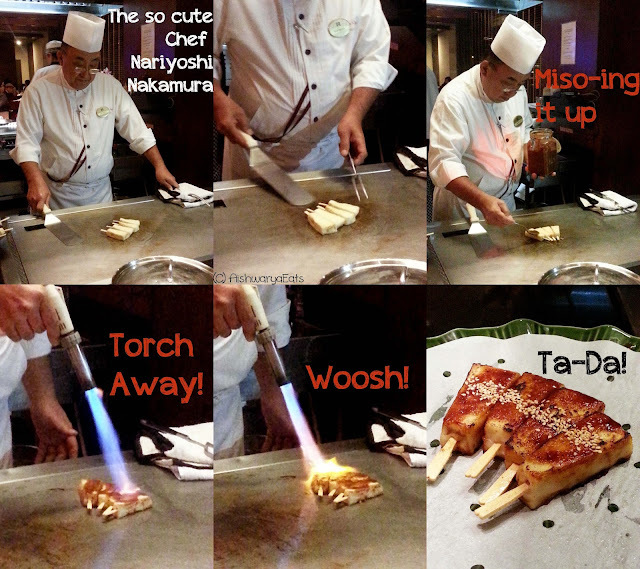 So he let all of us have a go at the Teppan station to grill up some Miso Tofu Steak with a generous sprinkling of sesame. The housemade Miso, the silken tofu, the blowtorch and it was FA-NCY! He made it look so easy, as you can see below. Mukta, Sangeeta and I tried it. Sangeeta's was so well made. Mukta's was fine. I wanted to make a Miso Tofu Steak. I made Miso Scrambled Burnt Tofu. Oh we had a go at the Yakitori grill too. I nearly scalded my hand and dropped a chicken skewer into the embers. Please, let me never join Japanese cuisine! After we tried both our creations, we sat down to the dumplings. Oh heavens! There was Ji Shao Mai, lightly panfried chicken coriander dumplings, Vegetable Koteh, beautiful steamed vegetable saffron coloured dumplings shaped like a bowl, and the perfect Xia Shao Mai, very delicate prawn dumplings. Each was better than the other. We just couldn't get enough! AT this point I should remind you that this isn't even HALF the starters menu. Deeba was stuffed and I was in close second! We next has the tastiest and crunchiest tempura ever. The chicken ones were soft, almost like egg whites. The vegetarian ones like baby corn, carrots, peppers were surprisingly delicious. One of the two vegetarians, I was happy to see that Sushmita had a host of vegetarian choices to gorge on. And the best was the prawn tempura. 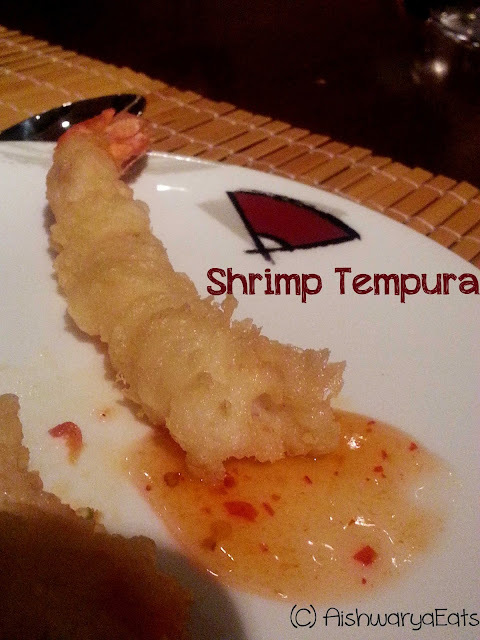 Straight batons of whole jumbo prawns in a shawl of crispy tempura batter, served with sweet chilli sauce. 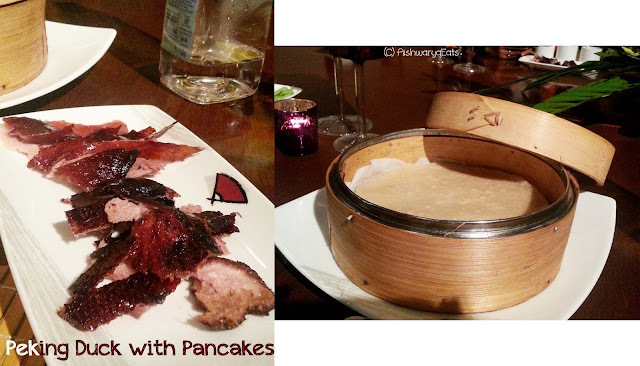 Peking Duck Pancakes. Say it and imagine what awesomeness that would be! It was crispy, caramelized skin and perfectly cooked duck meat, the softest pancakes in wicker basket, sweet Hoisin sauce, fresh shaved spring onions, cold cucumber slivers, to be assembled and devoured. This was another that I could just keep on having! The starters came to a close with Miso Shiru, that's miso soup with silken tofu and ribbons of nori. 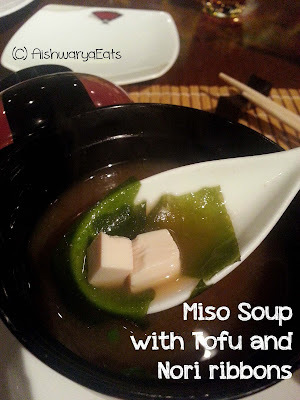 I realized miso isn't quite my flavour, I didn't quite identify with the miso tofu steaks either. The others slurped it up. It was served it a cute little bowl, covered to preserve the delicate aromas. The main courses began with stellar stuff. There was Jasmine Rice, served with Xioa Chao Jiding, which Hawker Style (very very soft) Chicken with Spring Onions in a beautiful Spicy Sauce. Followed by Mapo Tofu, which was Silken Tofu in a Sichuan Black Bean Sauce. Followed by Hunan Su Cai Ganguo, crunchy fresh vegetables in Hunan spices. So good it's not funny. 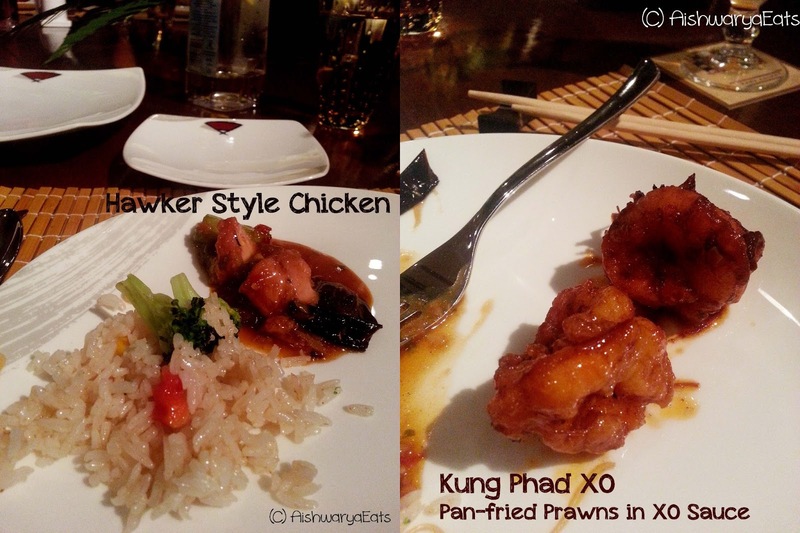 Followed by Kung Phad Xo, that's Pan-Fried Prawns with X.O. Sauce. The prawns were sticky, caramelized sweet with the heat of the X.O sauce. Parul loved the X.O, and I'll always remember her when I'll taste X.O. Followed by in my opinion the best item on the menu, KaengPhak, Thai Green Curry. Let me take a moment here and tell you how absolutely aromatic it was. 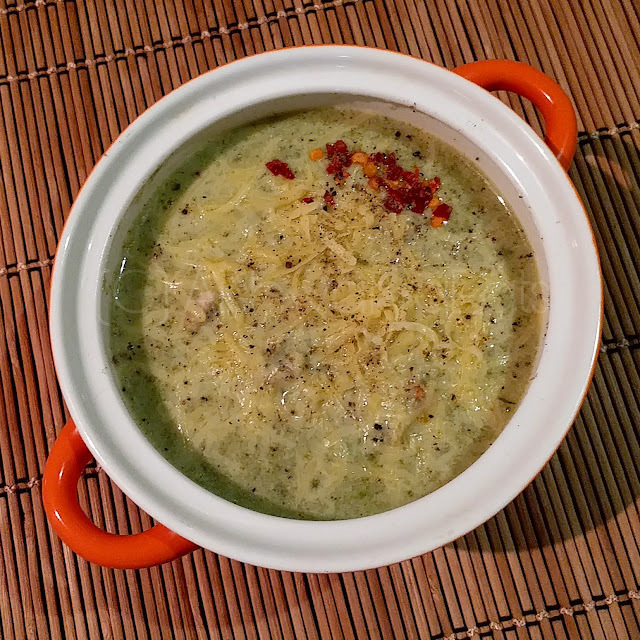 Lemongrass, coconut milk and that green smell with Jasmine Rice was an elevating experience. I could swim in it. I am feeling full just recalling it. But the piece de resistance was being wheeled in. 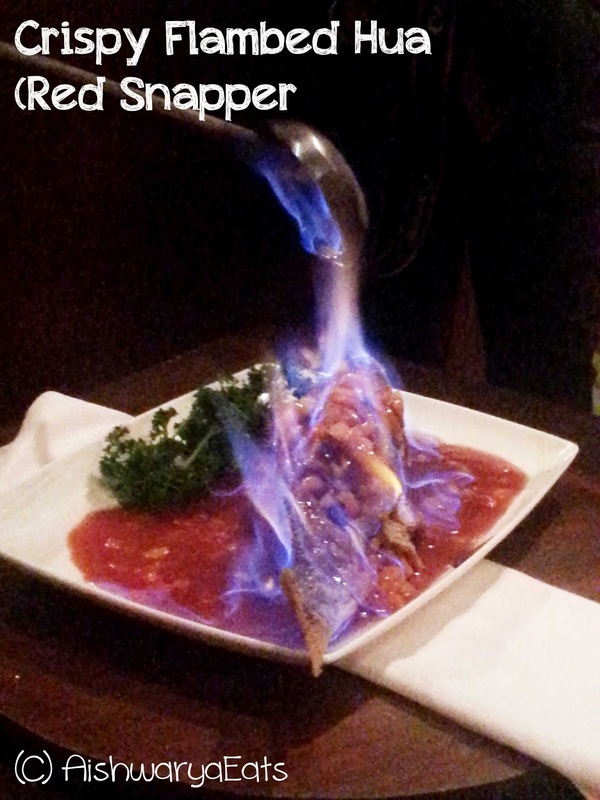 It was a Whole Red Snapper in Three Flavoured Sauce. Flambed right in front of us. Holy Fishies! Firstly, it was a spectacle. (I apologize for not very awesome pictures of it). The flame traveled from the ladle to the fish and engulfed it in a blue cloak. The fish was fleshy and flavourful and the skin was crisp and meltingly-delicious. Fork and spoon licking good! Desserts. You'd think we'd have burst by now. 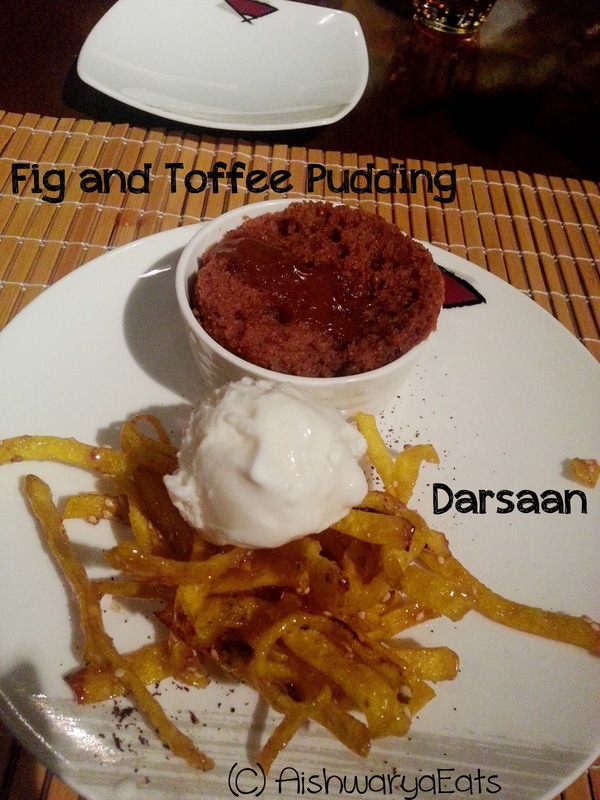 But not before a bowl of Fig and Toffee Pudding and a plate of Darsaan. Crispy honey fried noodles with a generous sprinkling of sesame. Fig and Toffee, you'd think it would be cloyingly sweet. But no, it was a self-saucing caramel coloured pudding, so light you could fly with it. This, believe it or not, was the end of a meal we had hoped would never end. We were by then in a food coma, and I did not have breakfast the next day. What an experience. It opened my panorama further to include more ingredients of Asian cuisine and it was a meal I will never forget! I just had dinner and I'm hungry again! Haha! Just remembering it gets me hungry and full all over again! Dying it savor it all...thank U for teaching us how to fine dine, Aish....Love the way U write.....yummilicious to the core!!! Dee come to Delhi no! @sonia1109: AAHhhhhhhhh!!! You're so sweet!